One of the things I've never done that I'd love to do is be in New York for the Macy's Thanksgiving Day Parade. To get to see the floats, bands, dancers, singers and be part of the Christmas spirit right in the middle of the action would be phenomenal and definitely a time to remember. Unfortunately while it's on my bucket list, it's not really a priority right now since Paris and Germany are next on the list. 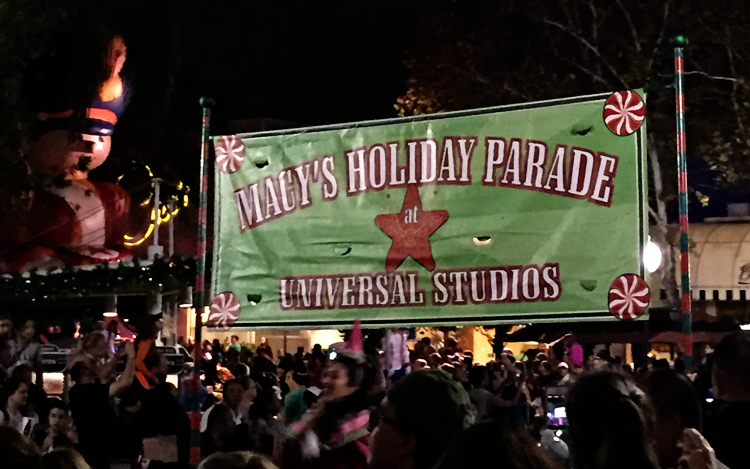 Luckily for Florida, Universal Studios brings the parade to us! 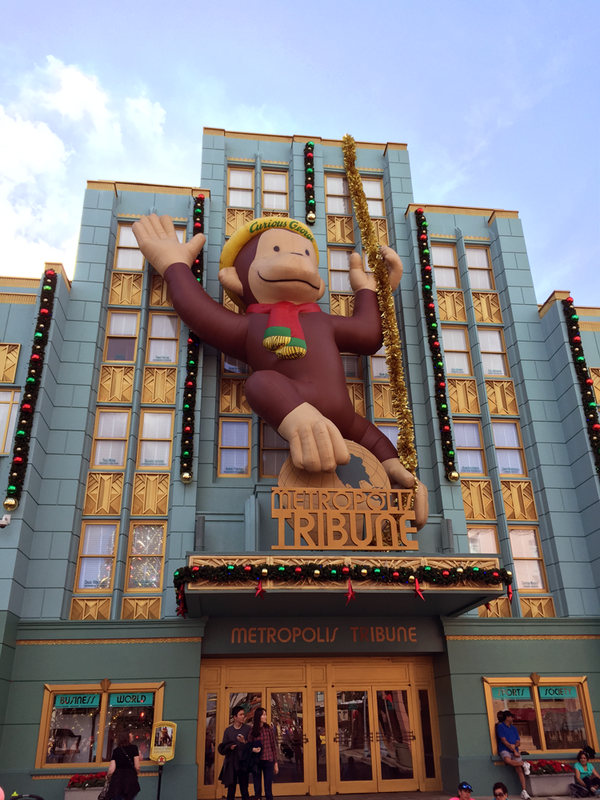 From about the first weekend in December, through the first weekend in 2015, you have the opportunity to experience the Macy's Thanksgiving Day Parade every night! 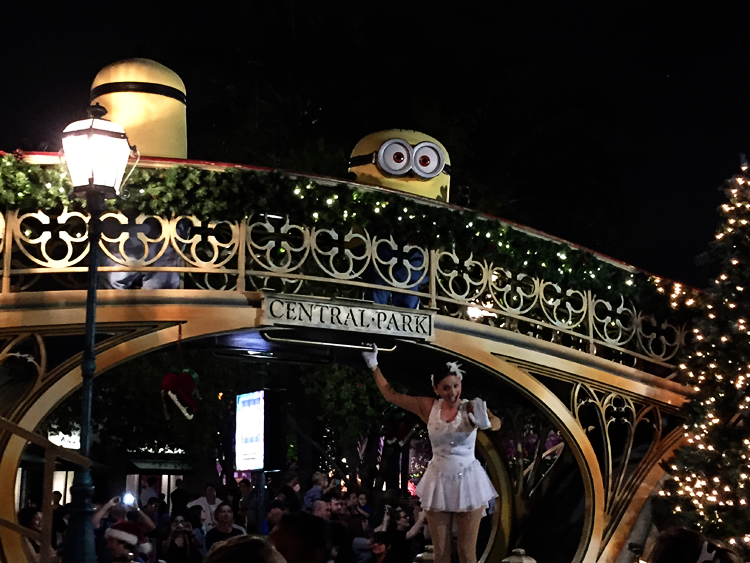 Most days the parade starts at either 5:00 or 8:00 pm depending on park hours. We went the weekend after Christmas and they only had an 8:00 pm show. If you live in the area, or happen to have a desire to volunteer I've been told they'll even let you hold the balloons! First things first, it's best to get there when the gates open or shortly after if you can. 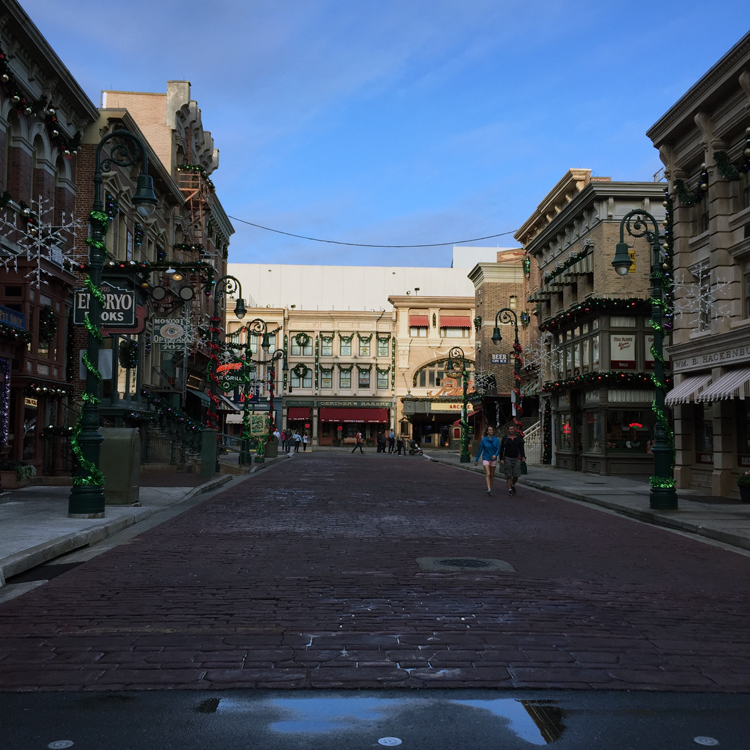 The streets are absolutely dead, so if you want pictures without people in them take them now. On your way to Harry Potter World of course. That's where everybody heads when they first get into the park. 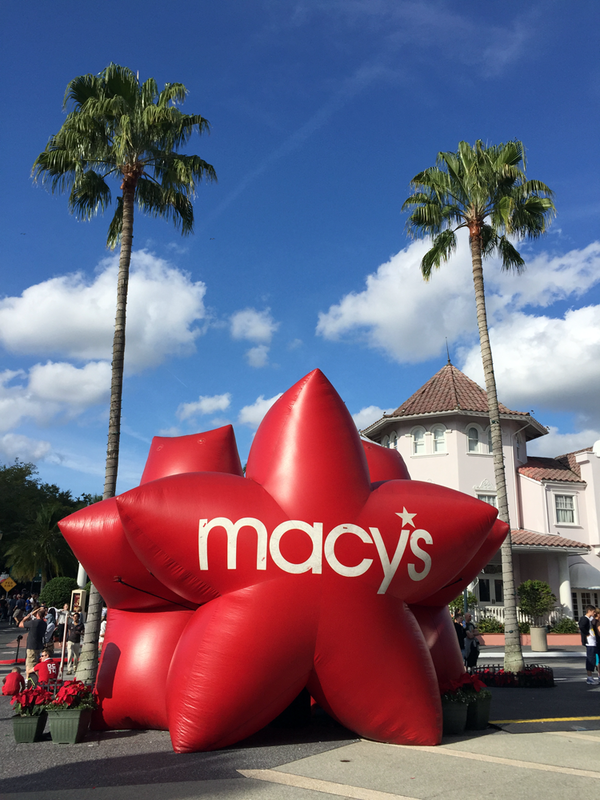 As you walk through the park, you'll see famous balloons from Macy's Thanksgiving Day Parade. Take pictures of them now, because they aren't actually part of the parade, boo. I had told myself we would leave the parade after the Scooby Doo balloon because my feet were killing me and then we realized none of those balloons were actually in the parade. 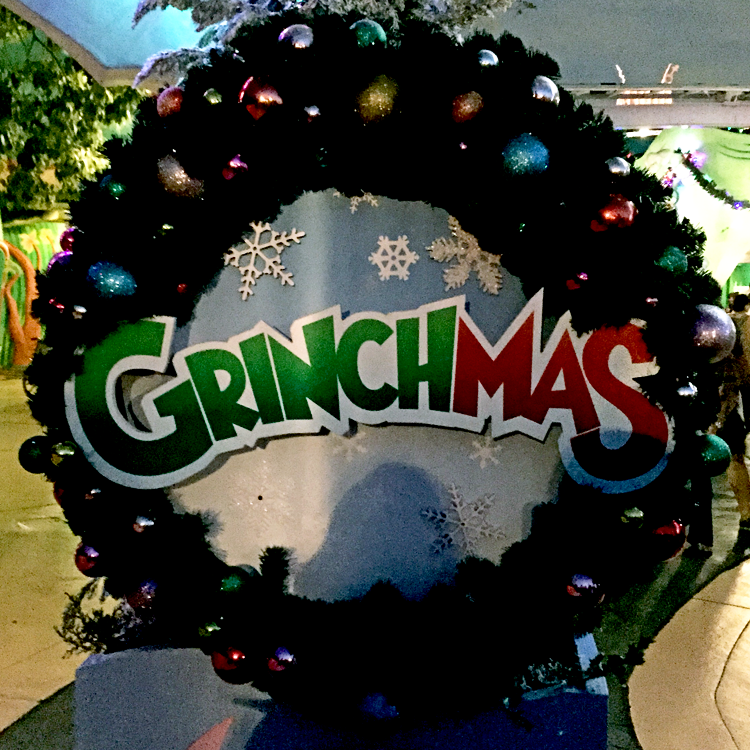 There are other Holiday things that happen at Universal Studios, including special shows like Grinchmas. We didn't make it to see this, but I've heard it's worth it if you have time. Let's talk about where to sit / stand so you can have a fast getaway because you'll be pretty tired if you've been there all day and on your feet. Some tips to help you on your day in the park. 1. Bring a backpack. 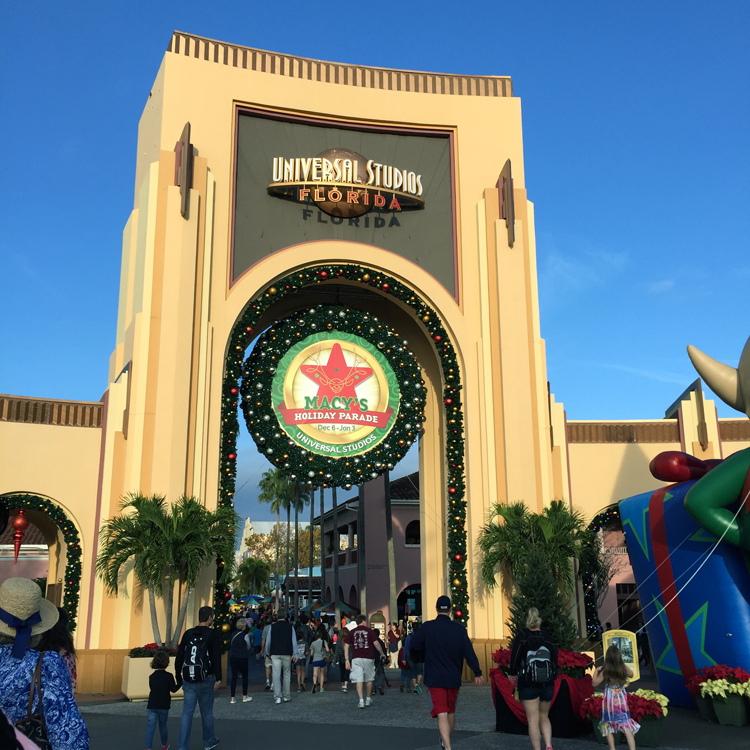 If you've never been to Universal or this is your first trip in a while and you're planning on doing any shopping you'll be thankful you brought it. You can also wear flip flops for the first part of the day and then switch into tennis shoes you brought in your backpack to trick your feet into thinking they're getting a break. 2. Take advantage of the Valet parking if you're looking to save time and rest your feet. You have to pay $17 for parking unless you're a seasonal pass holder anyway, so double your payment for valet parking at $35. We didn't take advantage of the pre-pay option of $45 because we weren't planning on staying until close at 11:00 but then our plans changed while we were in the park and ended up having to wait about 20 minutes from the time we got to the Valet section. We still didn't have to walk out to our car, but next time we would definitely pay that extra $10. 3. Buy one of the souvenir mugs. Especially if you're in Harry Potter World getting butterbeer. If you spend the extra $3 you get $0.99 refills of soda and tea all day. Butterbeer refills are about half a regular price, but we took full advantage of refilling our mugs all day. 4. Bring a portable charger. I actually got one for Christmas and I don't know what we would have done without it. We charged four phone with it as they dwindled throughout the day. 5. Download the Universal App. It shows you wait times, and helps you figure out where you are and get you where you want to go. 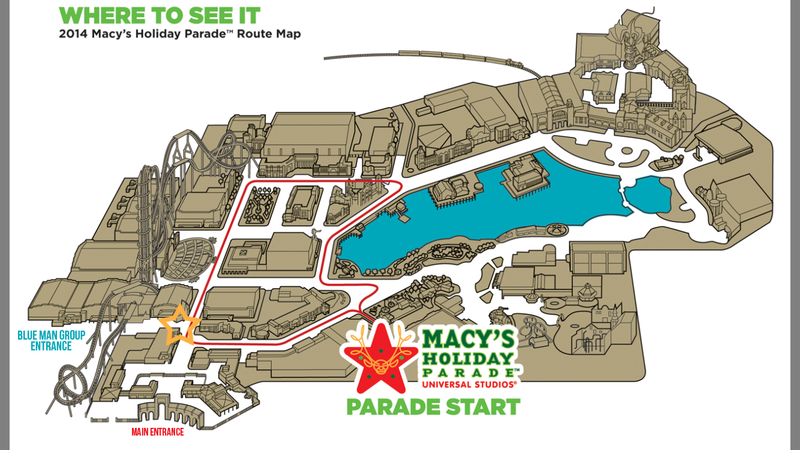 In the map you can see the parade route, but I also listed the two entrances. Yes, there are two entrances and on most maps it looks like the Blue Man Group entrance isn't really an entrance but there's an attendant standing there ready to greet you and say goodbye after the parade. There are a couple of great places to sit and I'll list my favorite first. 1. Straight in from the Blue Man Group entrance up against the parade route they have a section roped off for a walk way and park workers stand at either ends of this rope not letting people stand in front of you. You're also right in front of this other exit so you don't have to walk with the crowd out of the park. 2. 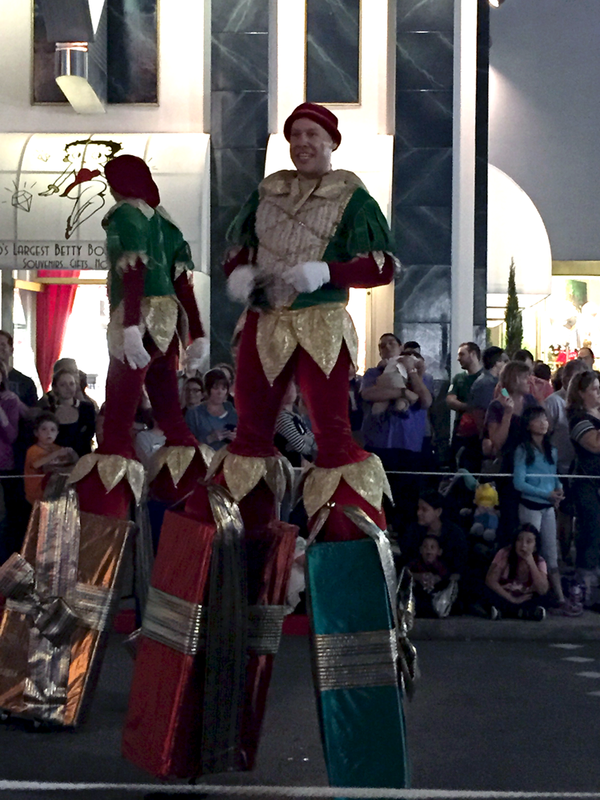 If you plant yourself in the back left corner of the park right in front of the Macy's store front and the Mummy ride, you'll get to see Santa stop and perform the tree lighting ceremony. 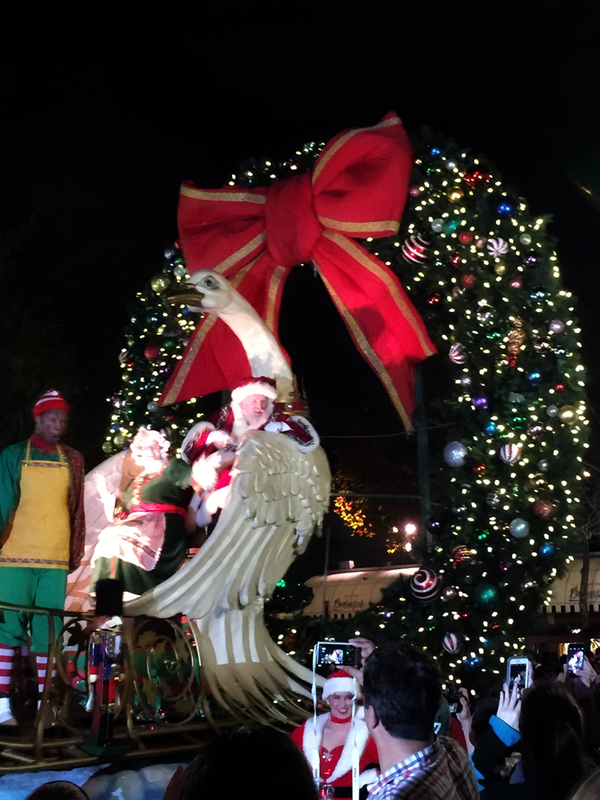 The Rockette dancers perform, and then once Santa departs a few of the characters stay around for photo ops. 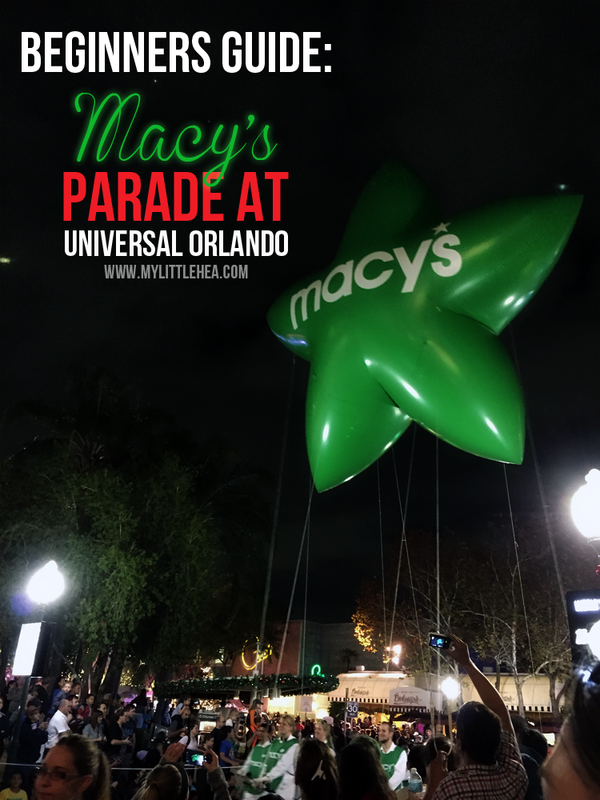 They have more than just balloons in the parade, like all of your favorite Universal characters giant mice on motorcycles, lots of people on stilts and Santa!! 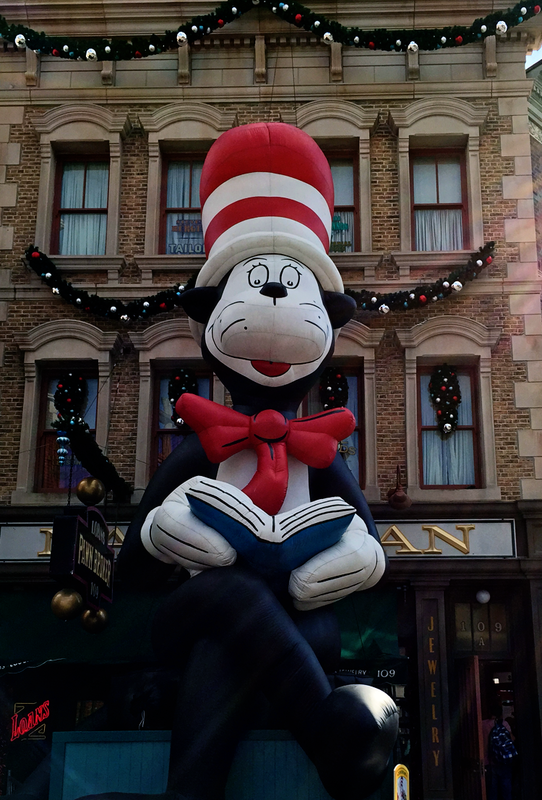 Have you ever been to Macy's Thanksgiving Day Parade in NYC or Universal? 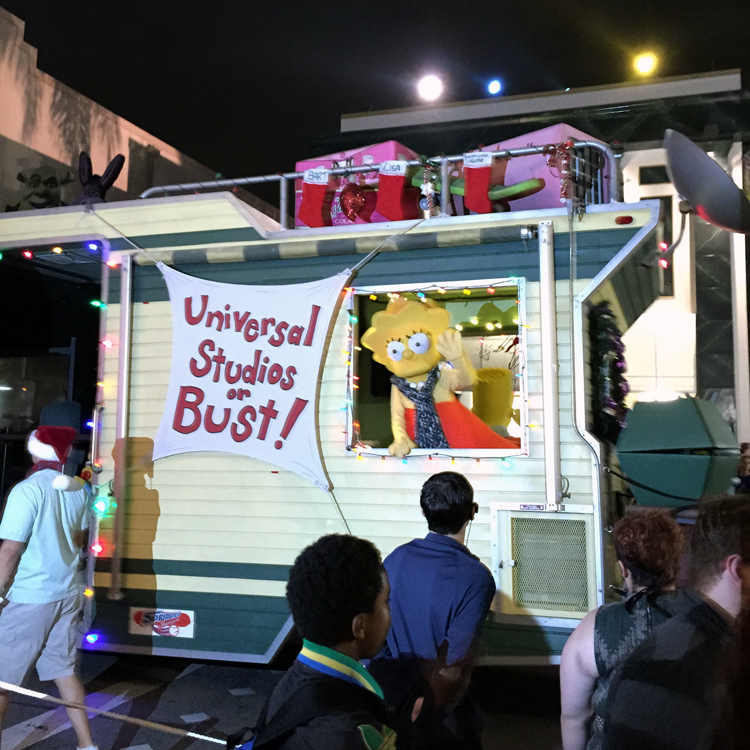 I never knew they did this at Universal, how cool! I haven't been to Universal in years, we need to go back because I know everything is changed since I was there last! That's one of my favorite part of Christmas! So cool that you live close enough to go there! I watch the parade but never been to the actual parade. I didn't even know these parks had apps that could give you info like that - good to know. This just looks absolutely amazing!!!! And I want a butterbeer so bad! SO BAD! One day I will get there...one day!!! Absolutely amazing! I so much coolness in this one post!